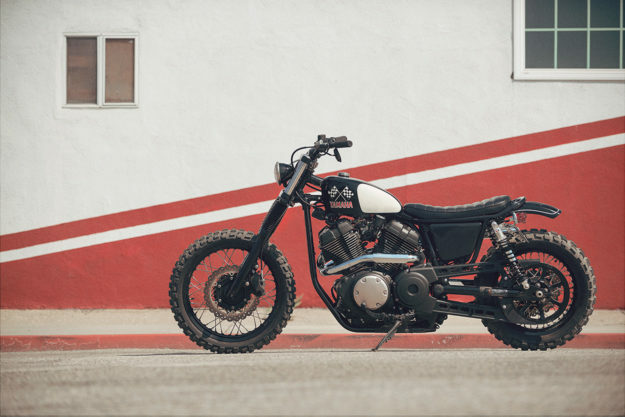 EXCLUSIVE: Every time someone refers to their bike as a ‘brat-style’ build, we let out a groan. There’s only one builder that can lay claim to that moniker: Go Takamine of Brat Style. 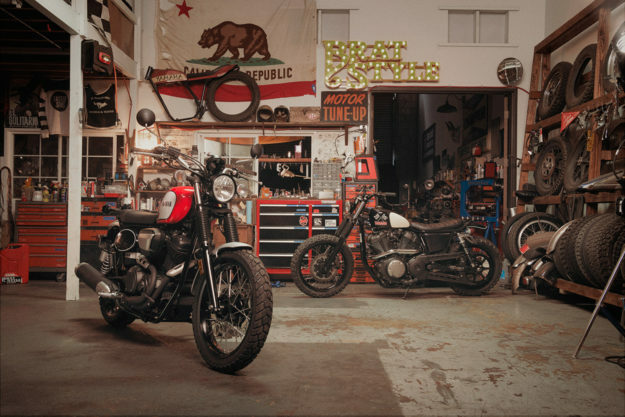 Go is one of the today’s most influential custom builders—with an aesthetic that’s often emulated, but never matched. Now he’s applied his unmistakeable style to Yamaha’s latest offering: the brand new SCR950. 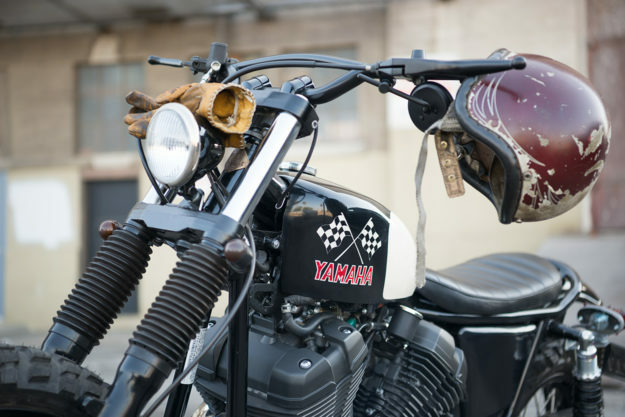 The build was commission by Yamaha themselves, as an official Yard Built project. 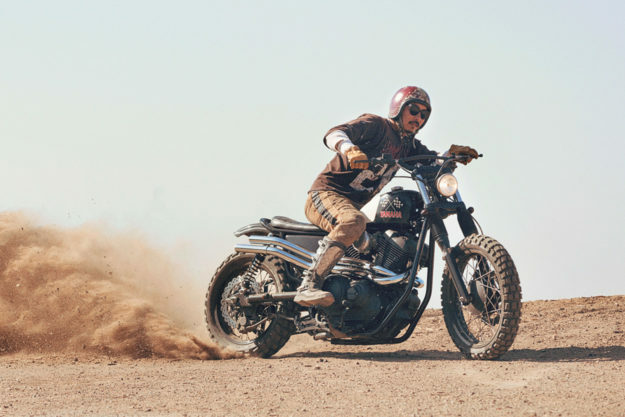 Go’s cranked the stock SCR950’s scrambler vibe up to eleven, with a bike that’s begging to get dusty. As a kid, Go used to watch U.S. soldiers ride dirt bikes around their base, near his home in Okinawa. 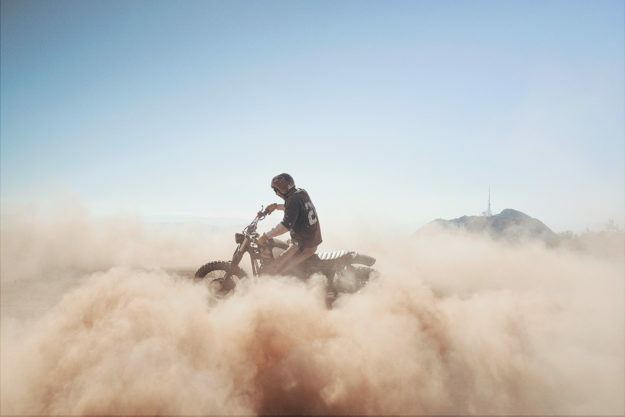 Years later he launched Brat Style in a small workshop in Tokyo, building bikes that speak to his love for all-terrain riding. 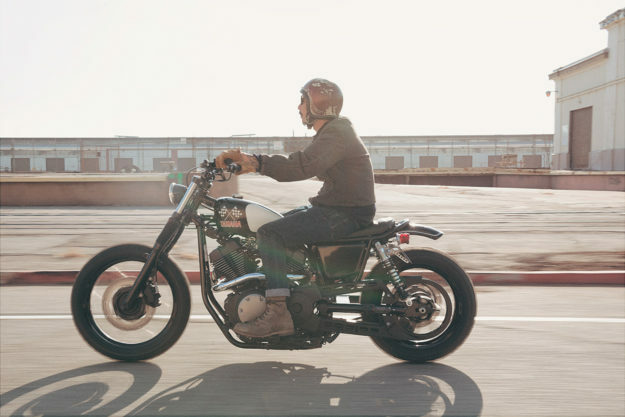 “After working with Go Takamine on an SR400 build several years ago, the finished custom far exceeded our expectations,” says Shun Miyazawa, Motorcycle Project Coordinator at Yamaha Motor USA. 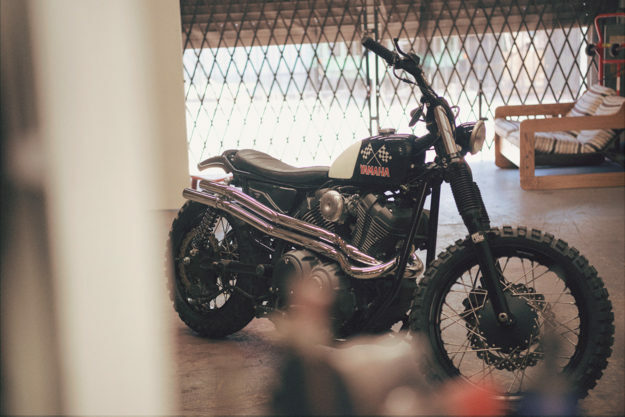 To turn the SCR950 into a ‘Brat Style’ bike, Go fabricated a new fuel tank, seat, side covers and rear fender. He also built that gorgeous, stainless steel twin exhaust system. 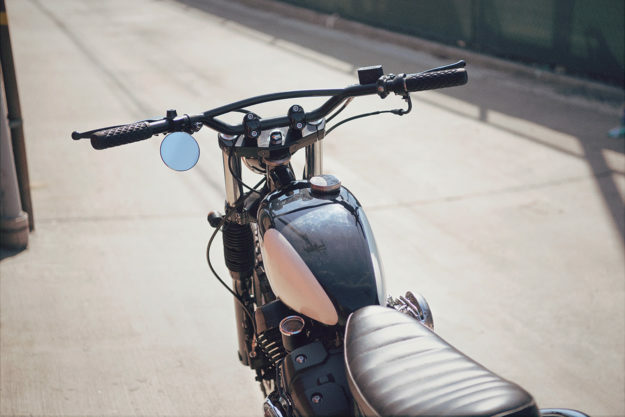 Up front are a set of wider, custom-made bars, and a smaller headlight. The cockpit’s been stripped right down—with bare-bones switches and a tiny speedo tucked next to the fuel tank. The subframe’s been rebuilt too. Go added more of a kick, and relocated the rear shock mounts—leaving space for a pair of custom-built rear shocks from Works Performance. The SCR950 now has more dirt-worthy suspension travel—and grip, thanks to a new set of knobby tires. 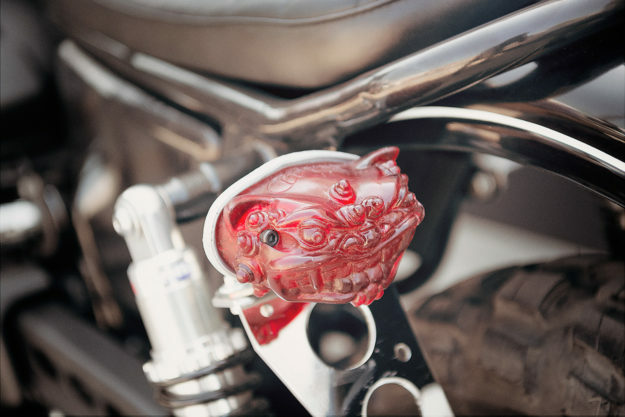 “I took out quite a bit of weight compared with the stock SCR950,” says Go. 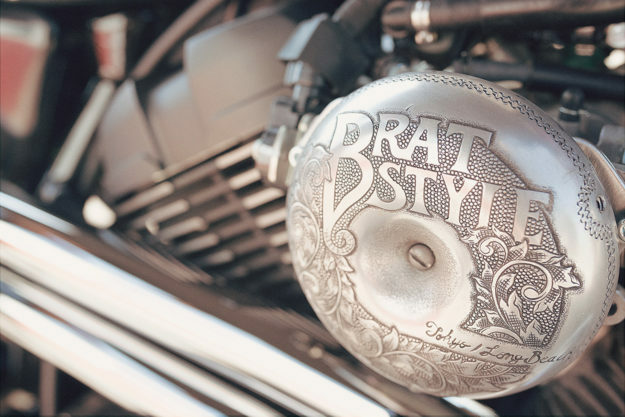 Signature Brat Style touches are sprinkled throughout the build—like the engraved gas cap, air filter cover and steering neck badge. And, of course, the cheeky side-mounted tail light. 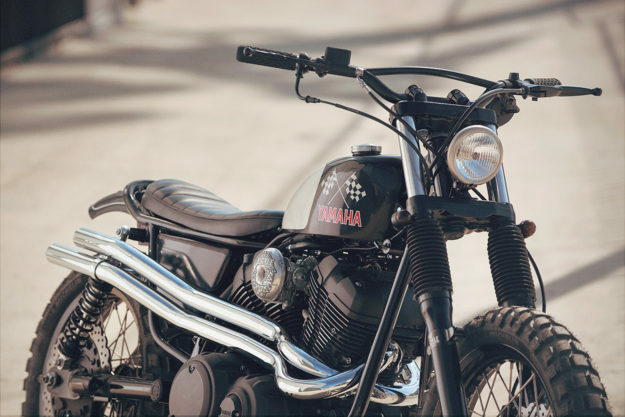 A classic black and white paint job finishes things off nicely, complete with vintage Yamaha graphics and checkered flags. Mauricio Aguilar handled the seat upholstery. 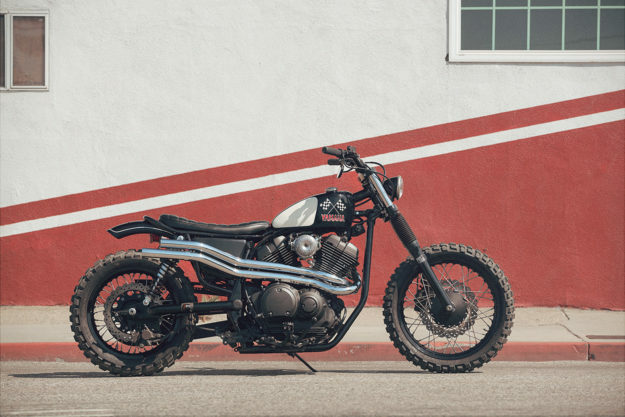 With his ‘Checkered Scrambler,’ Go’s proven that the SCR950 responds well to customization. Who can argue, when that personal touch is Go Takamine’s?